if you want to see how stupid we are becoming, you need look no further than Emoji. Not just that comic hieroglyphics are becoming the new way to communicate because reading is hard. It's that the PC-thought police intrude on language in a way that Orwell warned about in 1984: truthspeak, double-speak and so on, are all real. 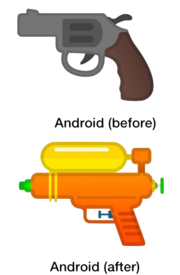 A tool (gun) was too hostile, so they had to change the language to omit it, and replace it with a squirt gun instead, even-though they have completely different meanings. Stalin would have been proud and that kind of revisionism. Google, Apple and Microsoft, see nothing wrong with it. Strange how some of the little things you do can ripple, and have much wider impacts. (Though my contributions were minuscule to the overall effort). My company was collaborating on an idea that encouraged kids to share their experiences with bullying through art and stories -- and they wanted to emoji to support an effort to flip it around by targeting those that witnessed bullying to be empowered. Someone internally (Megan Dale) needed connections to try to get to buy-in for the eye emoji (Unicode character adoption by Apple, Goog and Microsoft) to get it as part of their anti-bullying (I Am A Witness) campaign: 👁‍🗨, that my company was working on with Ad Council, Goodby Silverstein & Partners and a host of media companies. I connected her up to our representative (Ken Lunde), who got her a spot in a Unicode lunch meeting to make our case: and acceptance and adoption was stunningly fast (only a few months). Since the launch, this had over 100M impressions on the Internet campaign, and dozens of TV, Radio stations picked it up. So it was a good, fluffy effort to help victims of bullying, and encourage kids to speak up and say, "Eye see what you did there, and it's not OK". 2018 - Nora Hamada and Megan Giller applied to the Unicode Consortium for an emoji to represent birth control pills. They thought it was the first "Birth Control" emoji, but a condom company beat them to that, by a few years, but was rejected. A company (Durex) applied for a condom emoji back in 2015, but it was rejected. The thought police might have felt it was too racy or commercialized. But I always imagined creating a pictogram language would involve far fewer thought crimes. This page was last edited on 7 February 2019, at 00:41.